The SUM function in Excel is specifically designed to add values from different ranges. The SUM Function can be typed into a cell in Excel, or inserted via the Insert Function tool to the left of your Formula bar. The syntax of the SUM Function is SUM(number1,number2, ...). SUM is the function name, and contained within the brackets are "arguments", or the pieces of information that Excel requires to complete the Function. The SUM function allows from 1 to 30 arguments (number 1, number ....) for which you require the total value or SUM. If you wish to add cells that are non-contiguous (not joined together), type in your function =SUM( click in the first cell you wish to add. Hold down your Ctrl key and click in all other cells you wish to add up, then type in a ). Typing in a comma instead of selecting with your Ctrl key also works just as efficiently as well. You can easily use SUM to add up the same range in different worksheets. 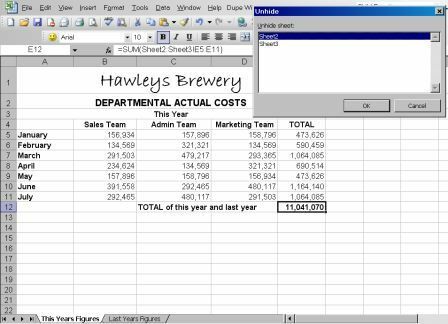 Click in the cell you want the result of your addition in, then holding down the Shift key, click on the next worksheet that you wish to include in your calculation and highlight the range to be used, then click Enter. One thing to note here however, is that if you insert a worksheet in the middle of the range that you have told the SUM function to add, then the same range on that worksheet will be included in your sum. TIP! If you wish to force any new inserted worksheets to be included in the SUM range, try this. insert a blank worksheet at the beginning of your sheets in your workbook, and a blank sheet at the end. Now in the cell that you wish the result of your addition to appear in type in =SUM( and then click on the new first blank worksheet and highlight the range you require to be added in all worksheets. Hold down your Shift key and click on the new last blank worksheet, then close your bracket ) and hit enter. Now hide the first sheet and the last sheet by going to Format>Sheet>Hide. This will force any new worksheets to be included in the SUM range as all new worksheets will be between the 2 blank ones.